With front-month WTI futures suffering their worst 2 days since 2016 into the start of the US long weekend Friday and a sudden proliferation of "lower for longer is dead" analyses, crude has justifiably loomed large in the eyes of professionals the world over, even with lots of light and some heat in Turkey (reforms to the CBRT's rate transmission mechanism), Italy (a technocratic PM choice from Mattarella that will most likely wind up with new elections), and Spain (Rajoy faces a no-confidence vote which may result in elections though that's TBD). As a side note, the Cackalack BTP view most recently published has been positively roasted by the market, though nothing that's happened since it was posted has fundamentally changed our perspective...that may shift if Lega election rhetoric shifts more aggressively anti-euro. Your humble correspondent doesn't have very many consistent views on commodities, but one of them is that speculation rules in the asset class. With roughly $190bn worth of crude represented in the open interest for NYMEX WTI futures alone, it's frankly quite difficult to have any other perspective. But fundamentals are surely worth a look anyways, right? Sure, why not, and as this outlet's excellent tagline always reminds us, TMM always offers a money back guarantee, so time spent reading is all you risk. As shown below, Q4 of last year saw global crude markets in a 37 bps deficit as a percentage of global crude supply, the third successive quarter where demand outstripped supply for the commodity following a grim run of excess supply dating to mid-2014. 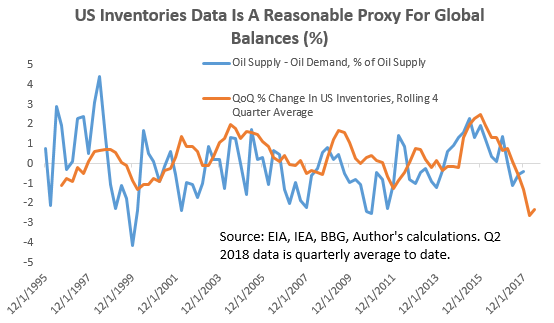 It's an awful pain to be working with numbers that aren't just backward looking but released at an interminable lag so in the second chart below we show the QoQ change in US inventories (aggregated from the almost-real-time weeklies released by the EIA). As shown, you can miss some big swings in global supply/demand of crude by going with the US weeklies but at the end of the day they've been reasonably accurate over the last several years. Q1 and Q2 to date are tracking enormous sequential declines of ~3%, suggesting similar supply-demand imbalances and higher prices yet to come. The crude curve basically concurs. With the 1st and 7th month Brent futures contracts (for delivery in July and January, respectively) logging a ~$2 backwardation, the curve is consistent with supply-demand imbalance of at least 1-2% of production, albeit less reliably than our estimates based on US inventory tracking. 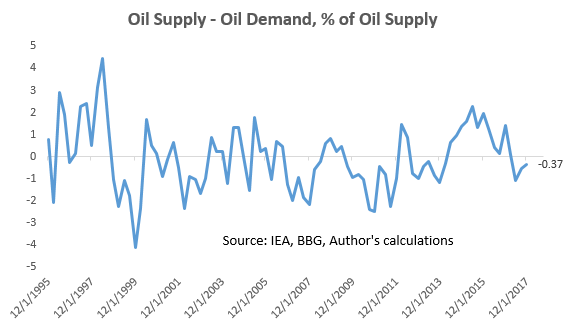 So for now, it looks like it's reasonable to assume demand continues to outstrip supply in crude markets. Will that continue forever? Of course not, but one point we did find interesting in the course of knocking these charts together is illustrated below. 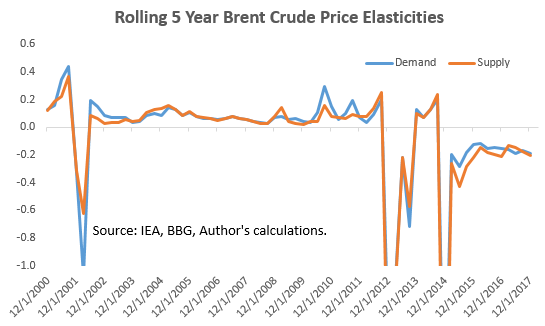 From 2000 to 2011, over 5 year periods the elasticity of crude to supply and demand was almost always above zero. That is, demand and supply both tended to rise in the face of higher prices and fall in the face of lower prices. That changed a bit in the 5 years ending 2012, when the opposite prevailed for a short period of time, but since 2014 both supply and demand changes relative to price have been negative. Now, calculating these elasticities is of course a tricky business and we'd be the first to say this is a very simplisitic approach. [By the way, if you have a better one, we'd love to hear about it in the comments!] But the fact remains something has definitely changed in the crude markets post-2011, and we're not so sure the "shale swing producer" thesis is the one reflected in the chart above. 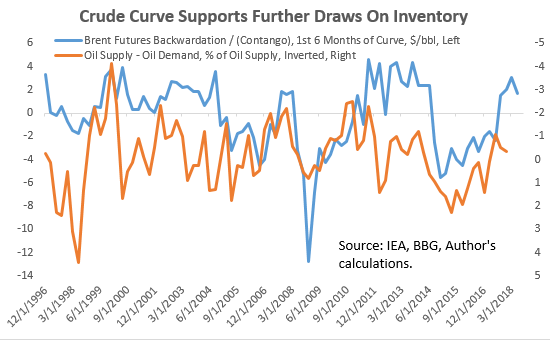 Theories are of course welcomed, but taken at face value the regime change suggested in the chart below leads us to believe that high prices won't necessarily curtail demand much, and that in turn suggests more (or exclusive) focus should be on the supply-side of the crude markets. If that's correct, it's going to be a very good summer for oil bulls, recent wobbles aside. Interesting and thoughtful post, will become relevant at some point, but not today. DB is following the lead of the Italian banks. Spoos down less than 1% thus far, but the VIX has jumped above 15 again. Nice post. Oil demand is very strong currently, but its just a lagged effect of strong global growth from last year. A strong dollar and strong oil is hurting some EM countries pretty bad (look at the mess in Brazil over higher oil prices). So i wonder what will be the demand pic for 2019. But for the rest of the year, physical markets will be tight, according to most. There is also the issue that US shale is simply too light for refiners to handle, hence the wide spread to brent and rallying prices of refiners. I take back what I said over the weekend about Euro CoCo's. I didnt have my Bloomy but was referencing a few I had looked at 3 weeks prior. Over the past week Euro bank CoCo bonds (basically put options on euro bank equity prices) are falling pretty hard. Not back to 2016 levels by a long shot but still a big move. A euro holding below 1.15 makes the technical picture pretty hard to interpret. IBEX has been the weakest equity market all year. Still above the Mar/April lows but if we start heading lower its not a good sign. Fans of fixed income are having an enjoyable day, short specs not so much. Strong dollar is killing EMs, but what's new? The 30y yield should stop at 2.97% or maybe 2.94%. Don't pile in there on the other side of this move just yet. When positioning is this extreme the forced covering of the rear-ended can be prolonged and painful. Munis, IG and the entire Treasury curve all bid. US banks being taken behind the woodshed. DB looking absolutely ugly again. Don't even ask about the Italian banks. Lots of feedback loops going on right now. I'll say this much, Eurozone problems are just going to exacerbate the dollar's rise, and will also likely lead to accelerated curve flattening in the USA as a result of the safety bid as we saw today. All of this of course affects emerging markets as well. I tend to believe that when the yield curve inverts in this cycle, it'll be similar to the 2000's cycle where it hits a rapid and sudden inversion not too long before equity drawdowns start to hit hard (unlike the 2006 inversion). Whether that happens soon or not is tough to say however. Overall, the yield curve has been kept afloat by the bond bear narrative, inflation expectations, tax cuts, and the fact that we still aren't that far from a 0% federal funds rate. Wow. A few people are having a bit of a rough day.... it has been a while since we had one of these. This is getting biblical. When was the last time we saw 10s and 30s move 15 and 12 bps in a day? Inversion-smerizion.... all those models worked bc there way a lag from when policy tightened to when the recession started...and so it looks like the "inversion predicted" the recession. The real signal however was when yields started to fall as all traders know. Yields fall in a recession (unless stagflation but thats out the market's memory unless you trade EM). And they fall fast. If yields hold where they are today we are going to have a key reversal in Treasuries on a monthly chart. TO go along with the a near key reversal in the stock markets made in February. Nico.... preaching to the choir, old man.... go eat a lot of cioccolato! 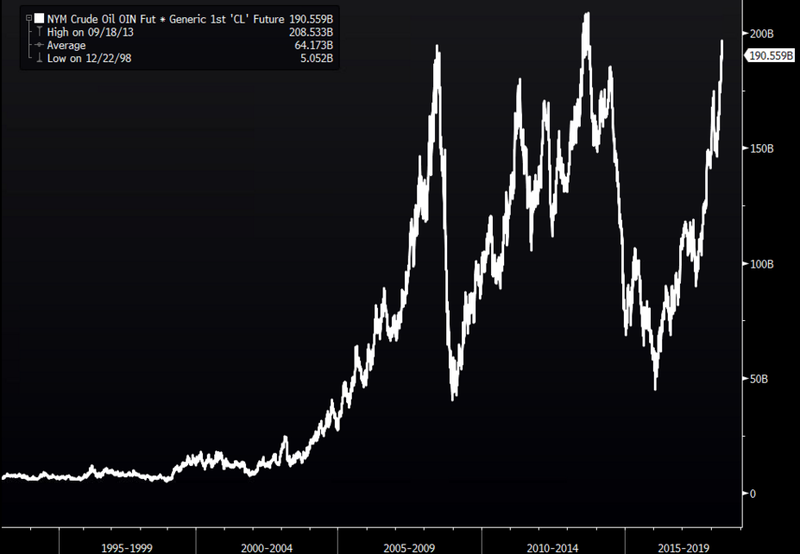 Seriously though, Italian yields lower than Treasuries was an accident waiting to happen. Lazy Sunbathers™, Pink Flamingos™, pennies and steamrollers indeed. ™ indicates a term coined here by the Original MM. so an interesting thing I just looked at... possibly just a coincidence given the small sample size. But since USDHKD hit the peg, there have been two separate times in which there were large defenses of the PEG. The first was the day China cut the RRR rate on april 18. The second was May 22nd. Both of these days mark big reversal days for world markets as well as . Just do a chart comparison of USDHKD vs. $VT for that matter Interesting to say the least. The Death of Bond seems to have been postponed, again. Even the Lego version of Goldfinger seems to make the usual error!!! why would anyone try to frame global market moves through the prism of HKD??? On the one hand this market move seems overblown, on the other - wheres your bid for 500bn BTPS. @Unknown, I'm not saying this is "framing" global market moves, but rather that it could be a symptom of them, or a window into bigger issues stemming from China. Or alternatively, it could be nothing. If you want my honest opinion however, I tend to believe that USDHKD is a canary for global liquidity. What we do know is that Chinese companies need dollar liquidity in a very strong manner. This was part and parcel with the global dollar short, and now that the dollar is rising, the dollar funding demands in China have likely risen. We also know that Hong Kong has become the primary source of eurodollars for mainland China, a change that HK took over from Japan at the end of 2016. This is consistent with the rise in USDHKD, and for why it is behaving differently than it ever used to throughout its history. I'm not saying Hong Kong defending the peg is why we've seen global liquidations, but I do think that global liquidity has a much bigger role in things than people realize, and that there is a STRONG relationship between this and things going on within Chinese borders (and no, I don't pretend to know everything there, lots of murkiness of course). In case people don't remember, we've seen this story play out before. This is a very similar same playbook from 2014 heading into 2015-2016 right now, with the only exceptions being that we're further along in the cycle with higher rates and higher commodity prices right now. In 2014-2015, we found out that China slowing and having lots of dollar funding difficulties with a falling CNY were at the root of most of the worldwide economic issues... That is until the PBOC along with Draghi injected a massive wave of stimulus. Keep in mind, the issues in Europe right now are NOT just related to politics. European economic data has by and large been awful in 2018. So with European rates being lower, european QE still ongoing, and a more recent recovery, why is it that Europe has slowed down so much this year? I would wager it's largely a product of dropping demand from China. Hi LB, howdy. Good to see you and Gus. @River, long time, dude, long time. Das Boot, I mean Deutsche Bank, has confirmed that it is seaworthy.... no leaks, nein, nicht hier in Das Boot. Interesting not on Crude and the DIJA. The Flattening is once again Happening. 2s10s 42 bps; 5s30s 30 bps. The curve is just not buying into the accelerating economy story despite the "blockbuster" (not really) US jobs report. Despite the last few days of Happy Clappy trading in equities and a modest recovery of BTPs, we have a feeling that the Risk Off mood may return relatively soon, certainly before July. Range trade again, for the time being it looks like SPX 2675-2740, with the next lower level being the 50day at 2611. VIX is back below 15 again, 12.50 being the recent bottom of the range. IWM small cap ETF is once again defying gravity as low quality "Trumps" value here. For now, we are happy to watch the circus from outside the tent, while the carnies pull in another groups of unwary punters. FOMC meeting is June 12/13 and we know that a hike is baked in the cake, so our attention has already shifted to their "forward guidance" once again. Tedious? Indeed. There is probably very little in the way of attractive trades here until we bump one or other limit of the present range. Another sloppy week of trading in prospect. Buybacks still in effect. Yields and spoos sliding upwards again. The exit of Rajoy hasn't received much air play but seems an important political event, if not an economic one. A relief to Basque and Catalonian people and a blow to the reactionary and retrogressive forces that backed Rajoy in the first place. A less hostile government in Madrid promises some improvement in another country with very high youth unemployment. Whether this crew will push hard against Brussels is uncertain but it does contribute to an increasingly beleaguered EU. DB share price recovering a bit - it is probably the single most important parameter in Europe for now. At some point it will fall below a critical level and then one day we will be in that maelstrom of counter-party risk where all Hell is going to break loose [and/or there will be a monster bailout]. Until then, markets will snooze. Just a thought for the near future. Share buybacks are going to head into a blackout period after June 15th. We know these have been bolstering domestic markets for a while. Similarly, QQQ is starting to trend into overbought territory, which may continue for a little while. I tend to think that the week of June 11 to June 15 will be a good time to buy some shorter dated puts on QQQ (or select FANG stocks potentially). June 15th also just happens to be options expiration and is just after the FOMC meeting. Not much chance of anything interesting happening before that, and a significantly higher chance of something happening after that date. 'The Original' MM used to posit that no major market sell-off can occur during major international soccer tournaments, although things were a bit dodgy during Euro 2012 I think. We'll see whether this immutable law of markets holds this time around. In the Treasury market yields are backing up predictably with supply of US3, 10 and 30y coming on line early next week ahead of the FOMC. Crude oil trading continues weak, notably in the US - with the WTI-Brent spread continuing to widen. "Indeed, in four out of the last five World Cups, market volatility did show declines in June, according to a Bloomberg analysis. The drops were bigger when the tournament was held in Europe, when matches were more likely to take place in busier trading hours, and volatility rose in 2002, when the competition took place in Asia. This year’s event will take place in Russia from June 15 until July 15 and will include teams from 32 countries. The volatility declines are slight, suggesting investors might not be able to lavish the championship with their full attention. Party poopers will tell you that trading volumes don’t show similar falls, failing to back up the hoped-for trend. Still, the good news is that most of the participating squads hail from Europe and emerging markets, suggesting traders from sources of the recent market gyrations may be distracted." Speaking of things being out of the way...SPX 2752 gap is filled. The next higher gap is way up there at 2822. But gaps below are closer: 2734, 2706, 2690, 2672. Have fun watching soccer! @ipa, are you doing anything on QQQ? Starting to get overbought, just hit the March high and stopped on a dime, and upcoming buyback freeze looks like a good opportunity to go short here. @Cbus, I don't like to short new highs. Nowhere to hide the stop. And yet the population of Tokyo grew by 304,000 since 2015, following the international growth trend for cities with critical mass. The countryside must be draining out fast. Half the posters here have again been proved MASSIVELY WRONG (shorting equity indexes from the Feb lows & watching stocks instead go back to ATHs). You guys are a better fade than Gartman, seriously. Oh, LOL. Look for crying out loud - put a sock in it, Anon, hardly anyone here has been short since the early May low, and most are swing traders anyway. Recently some of us have traded bonds and crude, btw, not being as, um, single-minded as Anon, sitting in his mom's basement trading 1 unit of QQQ. Get a better class of abuse or get lost, please Anon. SPX is NOT ATHs, although QQQ and IWM are. The outperforming IWM is a classic late cycle event, btw, as for some reason punters like to buy credit-dependent companies even as credit tightens. Right now looking at VIX < 12 it's certainly correct that May-June has been a good time to sell vol, ride the spooz or just sit on the sidelines. The super-low vol may continue through the World Cup. Obviously the insolvency of Italy, Argentina, Turkey etc is not going to change but it will still be there once the games are over. OTOH - the return of 12y-o HFMs to the comment arena has been a contrarian indicator in the past. Happy doing nothing for now, but will offer comment as FOMC approaches. Buybacks still a major driver of this market, luring in unwary punters with more and more hubris and less and less experience of late cycle markets. Watching NYFANG is amusing. If you were fading us you would never tell us you are doing such. Wise men speak because they have something to say; anons because they have to say something. We'll see where today ends, but it's notable that Fang stocks are looking extremely exhausted here. They were down yesterday despite most of Nasdaq being up, and today they all opened down as well. This is a notable item, especially when Nasdaq just broke out to all time highs yesterday. Also, I just looked back into the whole low-vol world cup thought, and I'm not sure how much I buy into that. It may have a slight affect, but I don't really think it'll be that impactful. Auctions and FOMC ahead next week. SPX 2780, 2800 and 2820 overhead. Absent some extreme hawkishness next Wednesday those targets are probably all in play into options expiration June 15 as the vol selling, spoos and qs squeezing trade continues. After that, we could have a whole new ball game, as corporate buybacks come to an end and the Fed balance sheet is set to contract again between June 15 and July 31. The contraction on top of the expected June rate hike translates to further tightening of monetary conditions. Europe may be too busy watching football to notice Italy, but they'll remember in time. Keep an eye on DB once again this Summer, it has been going bankrupt slowly but it might eventually happen all at once. GE is also in a lot of trouble, partly due to its probably insolvent pension scheme. There is a widely held assumption that DB must be bailed out by the German government, and GE by the US government. Should either of these prove not to be true, death will be extremely rapid and the pain will be widespread. Contagion and global recession would inevitably follow. TV touts were selling Bear and Lehman as safe investments to the very end, remember? Not "Sell in May and go away" this year, but "Sell in June, before the swoon". @Cbus, agree with you on some possible topping formation occuring on FAANNGs. Specifically, rising wedges are in place and FB is breaching the lower trendline and it is the weakest of the pack here in the last few days. Same thing happened in Feb-Mar when rising wedges formed. This being said, the new highs are bringing yet new interest from the aforementioned anons. So some follow thru is expected. I am not trying to talk out of both sides of my mouth, but the following levels will need to be broken for more meaningful selloff to take place: FB 182, AMZN 1550, AAPL 185, NFLX 322, NVDA 239, GOOG 1055. Until then it's all going to be a s/t pullback within a steep uptrend. I don't want to short a dull market in hopes of pushing it down. I'd rather short a retrace after this thing starts to puke. @LB, don't forget overseas news next week where Draghi could be announcing the end to the ECB's QE programs. Outside that, I find it rather curious how quickly people got complacent again in the current environment amidst the vol selling and share buybacks. Those do an excellent job of curtailing fears in the market. Despite this, I can't think of any headwinds or risks that caused markets to drop back in feb-march as being solved or behind us. In fact, most of them remain larger than before with the exception of Kim Jong Un playing with nukes. Given, I tend to think a lot of those items are short-term macro-touristy items, but regardless, they're still at least relevant. Most significantly, I think a lot of American investors / traders are really complacent with the US economy right now despite issues going on outside our borders. Europe's econ #'s are horrible and getting worse. Emerging markets have been having a lot of issues pop up, to the point where it's pretty obvious these are not entirely idiosyncratic. I see so many people saying the USA isn't in line for a recession any time soon because the traditional domestic economic indicators aren't showing bad readings. But I feel too many are ignoring the fact that we're far more global than before, and US companies get their earnings from abroad more than ever before. If the rest of the world heads into another slowdown similar to 2015, I don't see how the USA will escape heading into a recession not too long afterward unless one of the CB's embarks on yet another massive wave of QE like they did in 2015/2016 to stall a recession. Given impossible comps and the end of the crazy 2018 buybacks, 2019 is looking like it's loaded with landmines and risk everywhere to be seen as of right now. So just to summarize, I think a very underrated risk right now is that many of the traditional indicators used for market-timing in the USA won't register before markets start to drop due to the fact that a lot of markets dropping will be caused by economic weakness outside the USA borders. Traditional domestic metrics like unemployment, home construction, ism manufacturing, etc. only measure domestic economic activity. But when companies get a massive amount of their earnings abroad, these metrics are only relevant for the portion of economic activity that comes from domestic markets. "a lot of markets dropping will be caused by economic weakness outside the USA borders"
One note is that during the prev 2 engulfing days at the top of the range, it took a few days before we saw things really drop out. Considering opex next week, it makes sense to me that things may just hover around the 175 mark for a bit before any type of significant drop. (c) FOMC and ECB - pivot for FX. I bet we have at least two Happy Clappy days next week and may even tickle SPX 2800. Rally Caps on !! Just a thought - I think now is a good time to get in on the long end of the treasury bond curve. We just had a huge auction of long dated t-bonds, and just got a CPI reading that was more of the inflationary variety, yet the 30 year treasury bond is rallying. If long dated bonds are rallying despite these circumstances and the curve is flattening further, that tells me where the market wants to be. Woops - completely misread that - 30 year bonds aren't rallying. But at the same point, they're not falling that much and the curve is flattening further today. Still like this as an entry point for long dated tbonds. We still have the FOMC ahead and ECB potential tapering, both loom as potential dangers for bond markets. Lately, whatever the FOMC does/says with guidance is read as dovish for equities, complete with post-FOMC modest relief rallies into expiration. Still looking for a kiss of SPX 2800 and another sag in vol - to a high 10-low 11 handle VIX. Fair points, I suppose I just think that the market is tipping its hand a bit here and anything FOMC related has already been priced in. Nothing all that dramatic has happened during the past few rate hikes from my memory. I don't disagree with your position at all. It's just that I have learned finally to be patient when there are large speculative positions on, as they often have a way of becoming larger at my expense until they eventually keel over from their own weight. ECB is more of a danger than FOMC, b/c a move up in bunds of 10-20, even 30 bps is possible on anything that hints of ECB exit, and that simply has to drive rates higher in the US as well. That would be the kind of event to drive bond sentiment to the extremes that would be necessary to allow some of the larger speculators to exit and set the stage for a future squeeze. A short squeeze is definitely out there, but we may have to endure one more lurch higher in yields before it arrives. Note that any hawkishness from ECB would support EURUSD and a strong Euro is now a "risk off" FX signal. FOMC out of the way. A brief spike of 10s to 3.00%. Equities much ado about nothing. The curve has flattened further, 5s30s inside 30 bps now; the 5s7s10s belly is extremely flat (14 bps), flattest at 7s10s. Now we have to get through Draghi, and then we can re-evaluate the risks to the long bond. The curve itself is telling us that we don't have a great deal to worry about. Risks for tomorrow: a very hawkish Draghi (rate hike hints) = bunds/USTs sell off and EURUSD spikes. An unexpectedly dovish Draghi (delayed rate hikes, postponed tapering) = dollar surge/EMs crushed. Suspect that we will get neither of these. Hey leftback, you are playing a blinder, albeit nearly a solo effort! World cups ending in eight show (less empirical more novelty) that Germany Will either win this world cup or 2022 more weight added to this one, by the European factor. So ECB is phasing out their bond purchases, which is relatively hawkish, but no rate hikes, which is more dovish. Lefty, your not going to believe this. But having commented here since 2011 I have finally learned whats going on in the macro sphere. Their having me on. Unlimited quantitative easing and low rates have culminated in amps in the house having an epiphany on his way home from being abandon in Le'Estrange park on a Monday morning like would your favourite rabbit that you do the favour of not handing over for a kill. Is everybody on holiday or are markets currently such that it is better not to trade (à la Jessie Livermore: "I made most of my money by sitting tight")? Almost a month... give us a new article. The bars low! Perhaps a macro genius can explain whether an actual trade war is inflationary or deflationary. Watching football, innit. Have saved myself loads of money by not trading anything when nothing much was happening. crude, in particular wti at nose bleed levels..
My sincere congratulations. Great content, I found some useful information here. Keep sharing with us. we are working on this also. you can visit FOREXINWORLD for free trade signals, trade news, and high tension calendar event alerts with description. these is for serious minded and God fearing People. Packers and Movers in Mumbai understand basic requirement of client and give perfect solution of all type of packing and moving service problem. We are a professional moving company in Hyderabad offering packers and movers services at very competitive price.